What Does Bleach Do to Copper? Copper reacts when exposed to the chemicals found in bleach. This reaction can be intentional and used to produce a desired appearance for the copper. In other cases, the reaction can produce adverse affects and cause problems. Understanding the reactions between copper and bleach and using them appropriately helps achieve the desired results. Bleach oxidizes the surface of the copper. This is visible as a blackening or darkening of the copper surface. This same affect occurs when brass, which contains copper, is exposed to bleach. The color copper takes on as it ages is known as its patina. Using bleach can increase the speed the copper acquires the patina. In this way, some people use the reaction of the bleach and copper intentionally as part of the aging process. Although crafters may use this process to enhance the look of their projects, some dishonest people seek to "age" an item to fraudulently market it as an antique. Copper is an essential trace element necessary for human life. Some foods or liquids can absorb the oxidized copper caused by the bleach and copper reaction. For some materials, this is not an issue, but it can cause problems for beer or wine brewers or in the distillation of alcohol. 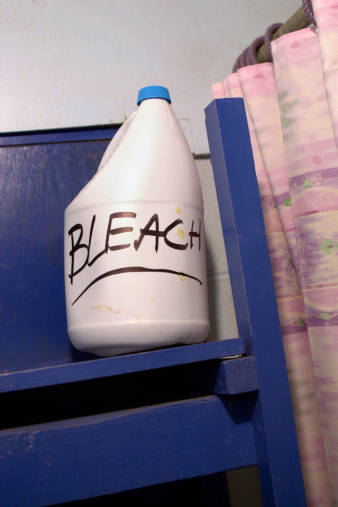 For these reasons, bleach is not used for cleaning containers or equipment used in the production of alcohol. Bleach also causes a corrosion of the copper surface. This is an actual change in the surface of the copper that breaks down the material. Copper corrosion can be caused by pollution and the exposure to moisture. While copper is known to have good corrosion resistance, bleach accelerates the process and can cause damage to copper pipes and fittings. Keith Allen, a 1979 graduate of Valley City State College, has worked at a variety of jobs including computer operator, medical clinic manager, radio talk show host and potato sorter. For over five years he has worked as a newspaper reporter and historic researcher. His works have appeared in regional newspapers in North Dakota and in "North Dakota Horizons" and "Cowboys and Indians" magazines.